One NZE building: the Research Support Facility in Golden CO, approximately 50% more efficient than it’s conventional counterparts. The noted American green building architect William McDonough is famously quoted as once saying that buildings should, among other qualities, “live off current solar income”. What was merely a hypothetic concept in the early 1990’s has since firmly taken root: Net zero energy (NZE) has taken on significant momentum as one of the factors shaping the sustainable construction movement. With the U.S. Department of Energy’s 2009 mandate that all new federal buildings will be NZE by 2030, deployment of NZE is now national policy. Beginning with the city of Austin, TX in 2009, local jurisdictions have since followed suit. Here in California, the next iteration of the Title-24 Energy Code (scheduled for July 1st) will require all new residential buildings to be NZE by 2020 and new commercial buildings to conform by 2030. As a relatively new concept in the construction industry, much ambiguity still exists as to terminology, definitions, and usage of the term Net Zero Energy. In her popular and highly influential book Energy Free: “Homes for a Small Planet” (Green Building Press, San Rafael, CA), Ann Edminster offers four (4) definitions, each taken from a different perspective e.g. energy usage at the project site, usage at the energy source, cost of the energy used, and by emissions associated with the energy usage. Of these, the most useful are the first and the last. The first of these, again taken from the perspective of the building, reads: “Net-zero site energy (Definition 1). A site zero energy building produces at least as much energy as it uses in a year when accounted for at the site”. In Europe, the most influential leadership towards NZE seems to be that of the International Energy Agency (IEA), an NGO based in France. Working within the framework of IEA’s “Solar Heating and Cooling Program Task 40: Energy in Buildings and Communities” initiative, researchers in 14 European countries plus the U.S., Canada, Singapore, Korea, Japan, Australia, and New Zealand are working to bring NZE into international market viability. 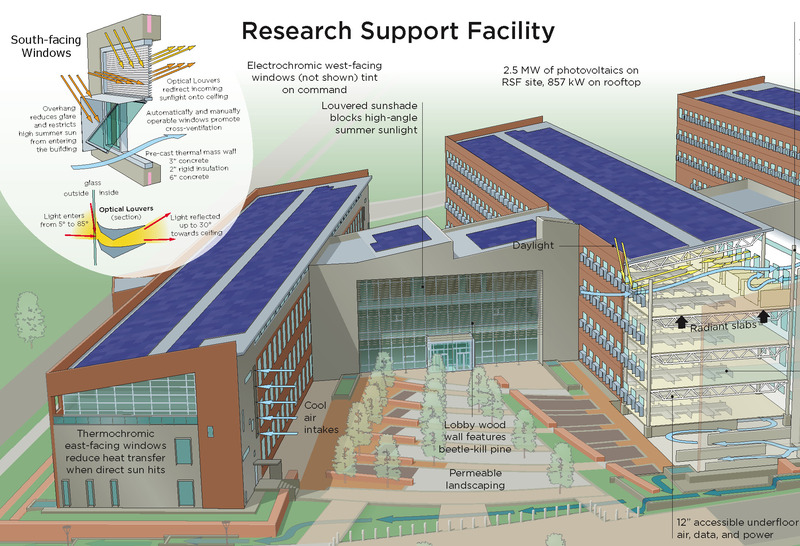 Rendering of NREL’s Research Supporting Facility depicting just a few of its “green” features. 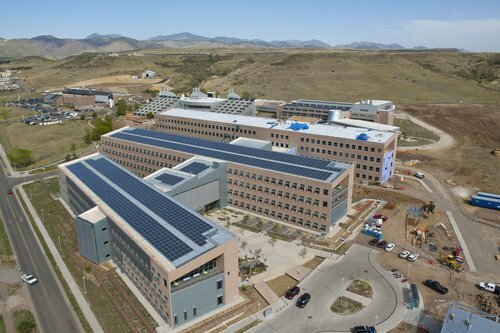 A good exemplar of an NZE building in this county is the National Renewable Energy Laboratory’s Research Support Facility (RSF), located in Golden, Colorado. This 360,000-square-foot, four-story office building’s energy use goal is estimated at 34.4 kBTU/ft2/yr. According to U.S. EPA’s Energy Star, the national median site EUI for office buildings is 67.3 kBTU/ft2/yr, making the RSF approximately 50% more efficient than it’s conventional counterparts. To learn more about NZE, some helpful resources include the U.S. Department of Energy Building America website, that of the Solar Heating and Cooling Programme, and Zero Energy Buildings: A Critical Look at the Definition. This entry was posted in Santa Cruz Architect and tagged architectural design, environment, green building design, net zero building, net zero energy, net-zero energy building, NZE, NZEB, passive solar design, Santa Cruz Architect, sustainable building practice, zero-energy building on March 21, 2014 by santacruzarchitect.